On October 14th CORBA celebrated its 20th year of mountain biking advocacy and community programs, and what a celebration it was! The 2007 Fat Tire Fest was a huge success with over 600 attendees, volunteers and bike industry reps and exhibitors, making The 2007 FTF our largest ever! The weather was perfect for riding and festivities which included the Poker Ride, Hill Climb contest, Wheelie Contest, Log-Pull contest, Mountain Biking Skills Clinic, great food, cake and Raffle. Downhill Champion Kathy Pruitt rode with mountain bikers through Malibu Creek State Park to the top of Bulldog, then joined Mark Langton in an informative and inspiring mountain biking skills clinic. Thanks to all who came out to support CORBA and enjoy great riding and festivities. For more information and to view pictures, visit the Fat Tire Fest page, sponsored by Code Roop Web Design. And a huge THANK YOU to all of the companies who participated in this year’s FTF! Please support these companies and stores when you get the chance, as they support CORBA and our efforts to keep the trails open for everyone. Special Thanks to downhill champion Kathy Pruitt for her participation, to Cynergy for sponsoring the Hill Climb Contest, and to Bike Warrior for sponsoring the Wheelie Contest. Joining CORBA means more than just supporting trails. Your membership also entitles you to discounts at retailers throughout Southern California. These retailers have chosen to support CORBA and our common goal of gaining and maintaining access to trails. Shop at these stores and support those who support us! The list is growing so be sure to check our website for the latest information. Don’t see your favorite shop listed? Helps us get them on board. Start by asking them if they support CORBA, then let us know who’d you like to add. Lombard Graphics has been a long-time supportor of CORBA by donating their printing services. We recently asked vice president Ross Lombard to share some thoughts on his mountain biking experiences. Terra Times: What type of services do you offer? Ross Lombard: We are a family-owned, commercial printing company located in Pico Rivera. We print everything from simple business cards to full color brochures. Our clients are mid to large sized industrial companies based in the Los Angeles area. My father started the company in 1978, so we are coming up on our 30th year in business. I’ve been working there for 21 years. I’m vice president of the company, and focus on outside sales and client relations. TT: How did you start mountain biking? RL: I started mountain biking 11 years ago. My younger brother got me into it. I borrowed a bike, put on hiking boots and a day pack, then climbed up Sullivan Canyon in the Santa Monicas. I thought it was a great experience… the challenge of the climb and the thrill of the downhill. A couple of days later, we went to Performance Bike and bought a rigid chromoly frame bike for $400. I was officially a mountain biker. RL: I love riding the Verdugo’s because I can start from home. Chaney Trail to Inspiration Point and Mill Creek Summit are favorites too. I also do quite a bit of road bike riding. 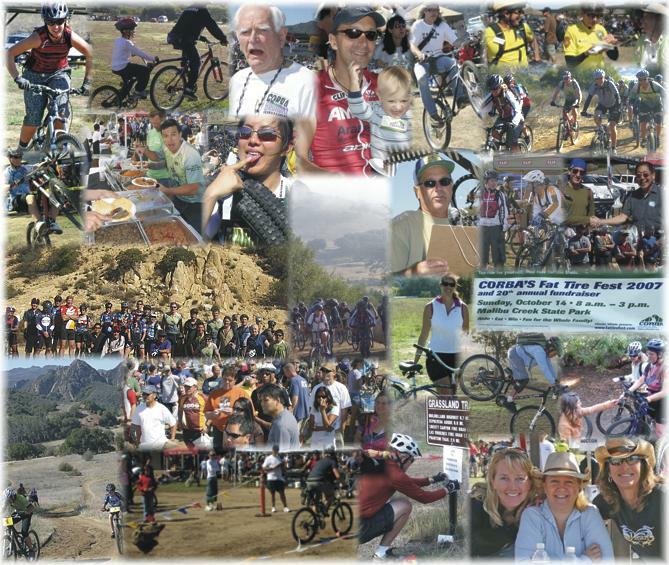 I really enjoy the organized charity rides in Solvang, Palm Springs and Ventura. TT: How long have you been involved with CORBA? RL: I learned about CORBA from Hans Kiefer (CORBA board member and Trail Crew leader) after joining Over The Bars Mountain Bike Club in 2003. TT: Why did you choose to sponsor CORBA? RL: CORBA members stand and fight for better trail access, and dispel the myth that mountain bikers damage the wilderness. I admire the work of the members, and am pleased that we can donate our printing services for such a good cause. Southern California is a fire-prone area characterized by an extended dry season and dense chaparral vegetation that dries out from spring through fall. Fire is a natural part of the Chaparral plant community life cycle, burning once every 30 years on average. Southern California experiences intense Santa Ana winds typically in the fall and into winter. Santa Ana’s originate over the desert at altitudes upwards of 3,000 feet and the air mass travels towards the coast at sea level. As the air travels down slope, it heats up and dries out. Combine these strong, hot, dry winds with dry, waxy vegetation, and we have extremely high fire potential. In LA County, fire danger is assessed by measuring the moisture content of vegetation. 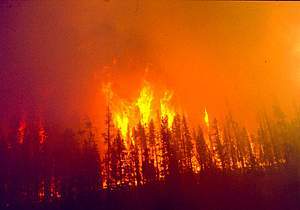 When plant samples have a moisture content of less than 60%, fire danger is considered critical. This normally occurs in September, but according to the Mountains Recreation Conservation Authority (MRCA), we reached this level by mid-June. The rains that we received in early Fall were not enough to curtail the conditions of extreme fire danger, and were not enough to prevent the tragic Southern California fires of October and November. Widespread and/or significant dry lightning. As mountain bikers, there are a few things that we need to be aware of. On hot and windy days, check the news and weather reports for Red Flag warnings, or call State Parks at (805) 488-8147. Avoid park areas that are closed, both for your personal safety and because if a fire breaks out, agencies may have to allocate their resources to evacuate you, rather than deploying those resources elsewhere. Following a fire, trails may not be opened for weeks. According to the MRCA, several things need to occur before park areas are deemed safe to re-open. Agency personnel need to make sure the fire is completely out (tree trunks and roots can smolder for weeks) and that trail hazards are alleviated or removed. In addition, surviving animals need time to relocate without the additional stress of human intrusion. And, when the parks re-open, it is more important than ever to stay on established trails to allow for natural regeneration of the ecosystem to occur and to avoid causing erosion, especially with winter rains approaching. As users of the backcountry, it is important for mountain bikers to act responsibly, not only when riding, but also by knowing when not to ride. Part of our continuing effort to gain access to more trails is demonstrating to both land managers and other users of the trails that we are responsible members of the trails community, and that we will treat the backcountry with the respect that is required to preserve it.